When people think of a relaxing and rejuvenating holiday, the desert isn’t usually the first place that comes to mind. More often than not, we usually gravitate towards the beach and island resorts. Something about the large body of water beckons the idea of relaxation, and the lush greenery of forests instantly soothes the mind. In comparison, the desert is an expansive area of dry sand that offers nothing more than just that — sand. However, we think you may just change your mind once you take a look at these gorgeous luxury desert hotels. One of the great things about staying in luxury desert hotels is that you get complete seclusion from the hustle and bustle of the city or town area. It truly is one of the ways to get away from it all — unless you’re voyaging on the high seas in a superyacht. With nothing left to do in the desert, all the energy you have will be channelled into self-care and indulgence. 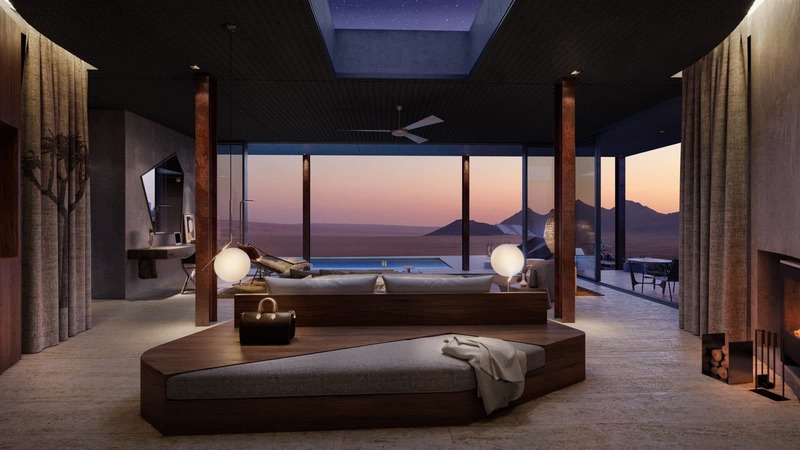 Luckily for you, these luxury desert hotels are so stunning that you wouldn’t even want to leave it anyway. From Amangiri’s sleek and minimal-looking oasis to glamping in the bush overlooking the Uluru rock at Longitude 131, you won’t even mind if you don’t remember your name after several days in the desert. 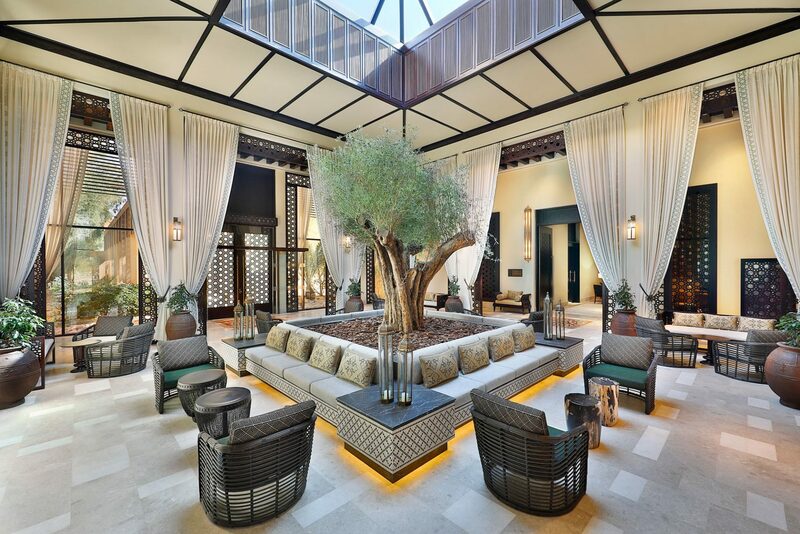 The Ritz-Carlton recently opened its Ras Al Khaimah property in the Al Wadi desert of Dubai, but know that the building itself is not new. Formerly owned by Banyan Tree, the gorgeous property now boasts 101 newly-refreshed standalone villas flanking the Bedouin-style pool and Farmhouse dining terrace. 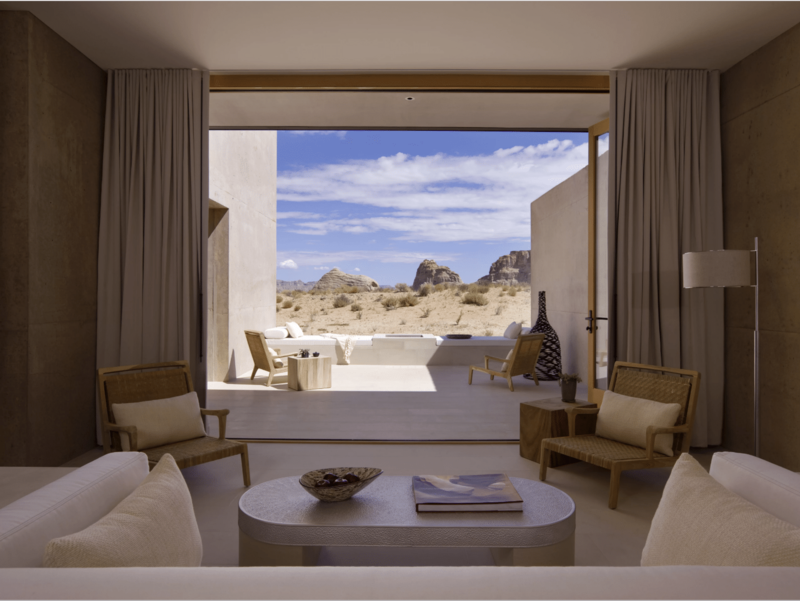 Each villa comes with its own plunge pool and loungers, so you can bask in the desert sun and look out to the nature reserve and dune sand scapes. The Ritz-Carlton Ras Al Khaimah, Wadi Khadija, North Ras Al Khaimah, United Arab Emirates, +971 7 206 7777. Juxtaposed against the ancient desert is the contemporary Amangiri, nestled within Utah in West America. The ultra-modern resort takes up 2,400 sqm of desert space, housing 34 suites decked in cement. That’s industrial minimalism at its finest. The main attraction of the desert lodge is the common pool, which has been built into the tableland of the landscape and considered an architectural feat. Otherwise, dine in the resort restaurant’s wood-fired cuisine and take in the myriad of spa treatments available in-house. Amangiri, 1 Kayenta Rd, Canyon Point, UT 84741, USA, +1 435-675-3999. Glamping is still here to stay, for those who enjoy basking in nature without actually needing to pitch their own tents and want flushing toilets. When you stay at Longitude 131, you get a chance at living in one of the 15 elevated tents that have been decorated with aboriginal artwork. Each of them has their own private balcony with a fire pit and day beds. Oh, and they all have a great view of Uluru — or Ayers Rock — while being a stone’s throw away from the Uluru-Kata Tjuta National Park. They say it’s the closest accommodation to Uluru, so this part of the bush is as good as it gets. Longitude 131, Yulara Drive, Yulara NT 0872, Australia. 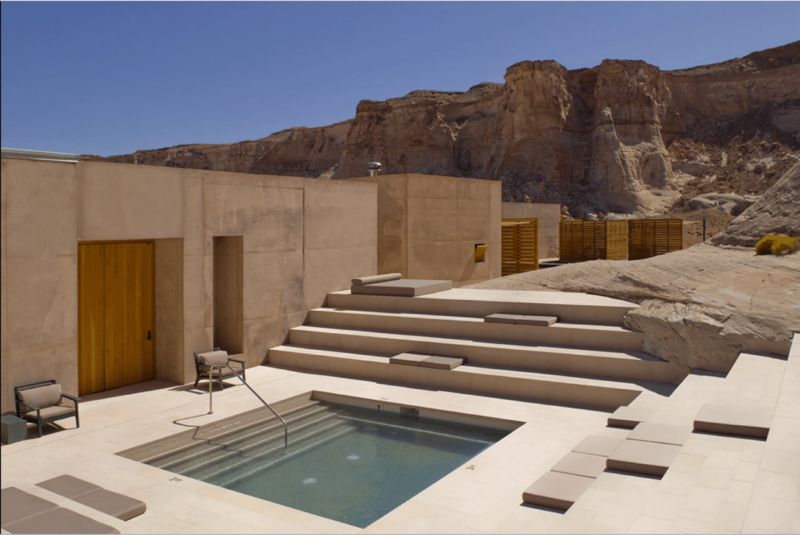 Yet another contrasting architecture is the Tierra Atacama Hotel & Spa, a modern building set on the barren desert of Atacama in Chile. With its sleek and sharp lines, the Tierra Atacama artfully merges contemporary lines with locally-sourced materials such as Atacameñan materials for its rooms. If you’re not one to stay in your lavish room all day long, pick from several excursions that the hotel offers: hiking and visiting hot springs, before settling down to a sumptuous feast under the stars. They did say that stargazing in the desert is extra gorgeous. 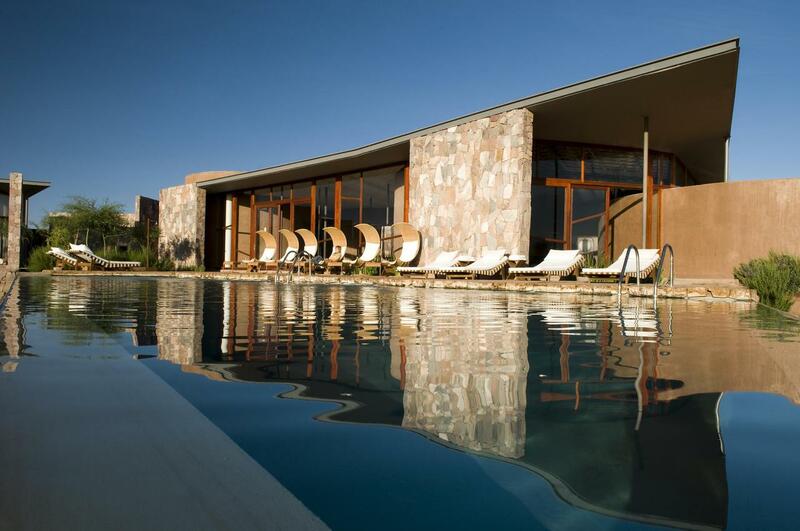 Tierra Atacama Hotel & Spa, San Pedro de Atacama, Antofagasta Region, Chile, +56 55 255 5975. We once recommended several luxury safari lodges in Africa to visit — but if you’re in the mood to combine both a safari and desert, the &Beyond Sossusvlei Desert Lodge in Namibia is your best bet. The villas are sleek in stone and glass, encasing within the modern minimalist quarters with skylights, lavish beds, and verandas to view the wildlife roaming around NamibRand Nature Reserve. The common pool gets its water from an underground spring, and at night, the resident astronomer will guide you through the stars — quite literally.